Siggy’s sound hearkens back to classic David Bowie ‘70s glam rock, especially the way vocalist Galen Buckwalter sings in a wavy, emotional manner and evidenced by how a Mick Ronson-inspired guitar lick introduces “WWGNRD?”. Yet Buckwalter is by no means your typical glitter rocker. Please note that this front man is also known as Dr. Galen Buckwalter, and is a former professor at University of Southern California. Furthermore, guitarist Ryan Howes has studied clinical psychology, which gives this four-piece a brainy edge – for whatever that’s worth — over much of the Los Angeles rock scene. 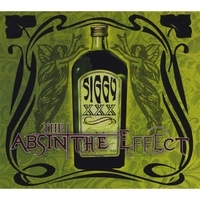 The Absinthe Effect is an apt CD title because this music is aurally hallucinogenic. Such wooziness is especially tangible during “Slap”, which adds The Velvet Underground inspired strings to its swirling mix. Buckwalter is a smart guy who writes intelligent lyrics, but there are times when his affected vocal tone annoyingly interferes with clear enunciation of the lyrics. This forces the listener to focus much harder than need be. In the end, one is left wishing this project contained more tracks like “Sign”, which finds the group playing a tamped down jangle rock tune accompanied with organ, as Buckwalter does a near perfect Ian Hunter imitation. Emotionally, The Absinthe Effect comes off a little like an angrier Radiohead. Whereas Thom Yorke and band turn anger inward on themselves — which is a layman’s definition of depression — Siggy spew vitriol in much more extroverted manner. With all the IQ and talent represented in this band, Siggy has great potential to provide a truly sobering effect on the listening public one day. To find out more, check out Siggy’s website at www.SiggyTheBand.com or listen to its music at www.myspace.com/siggytherockband.